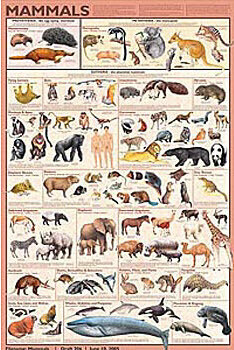 Mammals are divided into 3 categories on this informative poster: the egg-laying monotremes, the pouched marsupials, and the placental mammals. The latter are divided into 19 subsections, one for each order. Each category is first identified by its common name or most well-known species, followed by the scientific name of the order. Superb, highly detailed illustrations show 98 representative animals—from the aardvark to the zebra. Laminated.